Lexus Galway sponsored the annual Lexus Golf Open event at the Galway Golf Club, Salthill, during Race Week. Pictured are Tony Burke of Lexus Galway, presenting first prize to Donal O’Sullivan, with Galway Golf Club captain Marcus Conroy. Galway Golf Club and Ability West are celebrating a decade of the popular annual fundraising golf competition next month. 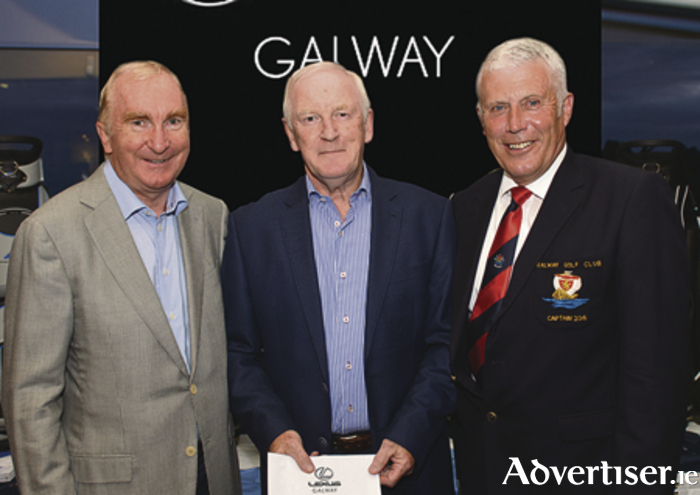 The open four ball competition, hosted by the Galway Golf Club in aid of Ability West, has so far raised €80,000 since it first began, and this year's 10th anniversary will take place on Saturday September 3. Launched by club captains Marcus Conroy and Ethna Joyce, and Bosco McDermott, who says this year's event promises to be another successful fundraiser thanks to the work of the club's committee members, sponsors, and the businesses and individuals who support the event. "Last year’s golf event had an excellent turn out with more than 250 golfers competing, resulting in €11,000 being raised for Ability West," says McDermott. All funds raised for and on behalf of Ability West are used towards its ongoing capital programme, which includes the purchase of new buildings, extensions and refurbishments of existing buildings, the purchase of essential aids, appliances and specialised equipment for service users, and minibuses. Tee times are now available, and the entry fee is €20 per person for members of Galway Golf Club and €30 per person for non-members. The competition is open to ladies, gents and mixed teams and will follow a fourball better ball format. For information on tee times contact Bosco McDermott on 087 7509066, and for those who would like to sponsor a tee or prize, contact Isabella De Luca 087-7730105. Ability West provides services and supports to more than 530 children and adults with intellectual disability, in 50 locations throughout Galway city and county. Services include day, residential, respite, rehabilitative training, support towards employment, community support, and multi-disciplinary support such as physiotherapy, occupational therapy, social work, speech and language, psychology and behaviour support. Ability West is also patron of four special schools located in Galway city, Carraroe, Tuam and Ballinasloe. For information about Ability West, visit www.abilitywest.ie, www.facebook.com/abilitywest, telephone 091-540900 or email [email protected]. Page generated in 0.1957 seconds.